Summer kitchen toys to check out! Well hello! Oh how I've missed posting here. In fact, the only time I have to post lately is when everyone else is asleep and if I'm not too tired myself! Life has been beyond busy and I will be coming back with my regular recipes and kitchen happenings soon... but since it's been nearly three weeks since my last post, I want to share some of the things that's kept me away. Secondly, the wedding season had us attending a couple of weddings - two within a 72 hour timeframe! One was for my dear college roommate and the other was for my brother. Those kept us busy in anticipation. Third was the Memorial Day holiday in the mix. We hosted a cookout and had a great turnout with some of our closest friends attending and welcoming them to our new home. After hosting our first party at the house, we're looking forward to many more opportunities to entertain our family and friends! Fourth is my work schedule at the pharmacy along with my teaching schedule between the classes I have in Chicago and the northern suburbs. I've found a new kitchen space to work and teach from in the city, which has kept me busy outfitting the space and planning my classes accordingly. I've also been working with local park districts, community libraries and other venues in the suburbs to teach - all of which had my schedule and calendar booked. But as of right now, things have settled down and I'm anxious to get back into my old routine of cooking, baking, and sharing. I will say that moving is a pain in the rear. I hate moving... namely because I feel as if I've moved way too many times the past several years. Thankfully, it doesn't seem like I'll be moving anytime soon. The Baron, Joel and I are quite happy living under one roof and we're looking forward to the adventures we'll be taking together in the future! In the midst of my unpacking, I came across some great kitchen gadgets that you may want in your kitchen this summer. Here's a round up of items that are perfect for the season! 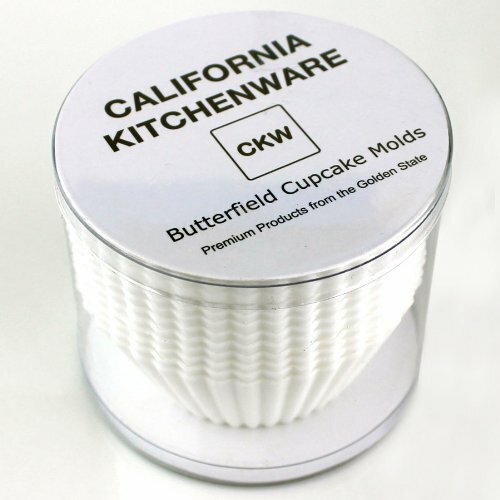 California Kitchenware Silicone Cupcake Molds - Forget the paper cupcake liners. Many of the cute, colorful and/or printed ones are difficult to even appreciate because the patterns don't shine through once a cupcake is baked in them. They also end up in the garbage, contributing to additional waste. These silicone cupcake molds are the perfect answer! Not only do they bake up batter perfectly, they also present well when finished. They are packaged in a tube of 12 cups and can be used in the oven up to 500 degrees. They are also freezer and microwave-safe. The cups are made with food-grade, nonstick silicone and fit standard muffin pans. I also love that they can be placed individually on a flat cookie sheet or jellyroll pan too without affecting the shape when used for baking. They also are great for individual gelatin dessert too! The best part is that they are reusable and can be easily cleaned by hand or in the dishwasher. Aside from cupcakes, I've used them for muffins, mini quiche, and mini flan. 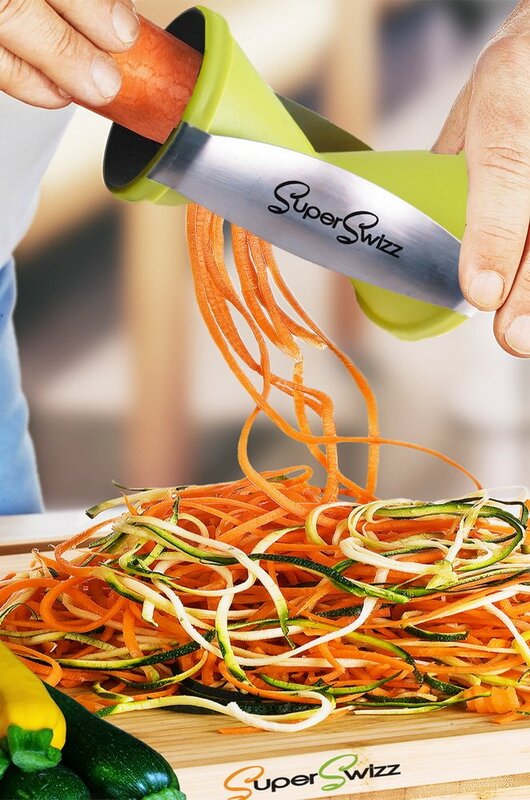 SuperSwizz Spiral Slicer - With summer vegetables coming in season, I like taking advantage of using them in various dishes. This slicer is a great way to turn vegetables into ribbons of vegetable pasta, thin shreds for salads and a fun way to serve or prepare vegetables for kids. It's easy to use, as if you're sharpening a pencil! Clean up is too since it comes with a cleaning brush or you can wash it in the dishwasher too. The Japanese blades of the slicer are made of stainless steel, which creates julienne strips in 2 sizes - 2x3 mm and 3.5x5 mm. I especially liked using this on carrots and zucchini, which I then made into carrot cake and zucchini bread. Stir fries are another good use for the tool to create thin strips that cook quickly. Since I teach sushi classes, I found this tool to also be great in creating some fancy garnishes too. Cakes Under the Influence Entertainer Baking Kit - It's summertime and it's the perfect time to entertain! Break out the cocktails... and infuse your desserts with them. Cakes Under the Influence is a local company and I love how they've made it easy to add some fun to your cupcakes. This adult dessert idea mashes up cakes and cocktails for delicious tasting margarita shaped or martini shaped cupcakes. The Entertainer Baking Kit comes with everything you need to glam up your favorite cupcake recipe and includes your choice of either 12 martini or margarita baking molds. These anodized molds are great conductors, stain resistant and easy to clean. A dozen greaseproof baking liners are also included to easily transfer each baked item from the baking mold to the serving dish. They look elegant on the table and also make it easy for guests to hold the cupcakes without getting messy. A dozen silicone stands, cups and a serving tray are also included for the perfect presentation of your cocktail cupcakes. Kitchen Gurus Glass Top Digital Scale - I can never have too many scales in my kitchen. This is one of my favorite scales because it's so reliable. I weigh a lot of my ingredients, especially when I'm baking gluten free goodies, so it's important to have a good scale on hand. This Kitchen Gurus scale is easy to read with its high contrast LCD display. It also allows to tare/zero out weight as needed. The scale also measures out grams, ounces, fluid ounces and kilograms. And I like how it's easy to clean and made of durable tempered glass that can hold up to 11 pounds. Tapple - At our house, we try to incorporate a game night and we recently tried our this game, Tapple. It's a fast-paced word game where you choose a category card and start the timer on the Tapple wheel. In just 10 seconds, name a word matching the category, press the first letter of that word on the wheel, tap the button to reset the timer, and pass it along. Letters already pressed may not be used again. We had a lot of fun and it reminds me of the 'Alphabet Game' I played when I was young. With this game, Joel has learned some new words and I've found it to be a great teaching tool too for young children looking to expand their vocabulary. If you would like to receive this game to try out, send us a message through our What's Cookin, Chicago Facebook Page/to qualify and a random winner will be chosen by June 27, 2014! Hello, I just happen to drop by in your column. Anyways, you mentioned about SuperSwizz Spiral Slicer , what else can you say about it? I am planning to buy a spiral slicer and I am looking for something easy to use and can take all kinds of raw foods. Are there tools available like the one I mentioned? Thanks.